A few years ago I did a blog a day on a Halloween related topic in the month of October. While I have no intention of carrying on with that project, I am going to write about some Halloween themes this month. In 1989 when WCW introduced the world to Halloween Havoc I was a big fan. Even though I was a huge WWF fan, I still was a wrestling fan in general and when the competition offered something different I took notice. The main event that year was Sting and Ric Flair against the Great Muta and Terry Funk in a Thunderdome match. Two years later we got the classic Chamber of Horrors match where Abdullah the Butcher was placed in an electric chair and zapped. Fast forward now some 25 years and WCW no longer exists. WWE is providing two pay per view specials per month because of the new brand split. The company brought back the old Clash of Champions for the most recent Raw event. I'm in favor of bringing back the Halloween Havoc moniker and going back to some of those cheesy, campy matches from the past. If you're a regular reader, you know I'm not crazy about the gimmick matches, but a Chamber of Horrors match or two under the Halloween Havoc name could be good for nostalgia purposes. 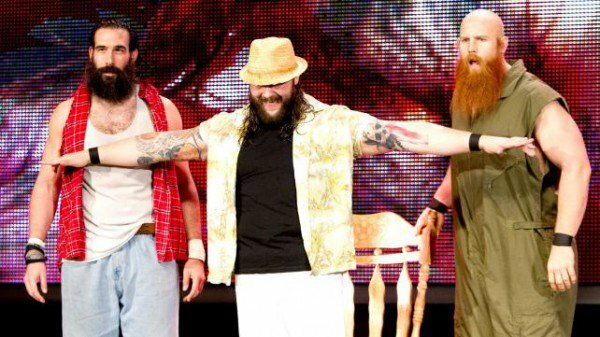 It seems the Wyatt Family would be the perfect group to lead a team into battle in this type of matchup. I was disappointed after WWE bought WCW 15 years ago that Halloween Havoc wasn't one of the events brought over. Great American Bash may have been one of the few events that made the cut. What's old is new, so I say bring back Halloween Havoc. I know it's too late this year, but I'd love to see it happen in 2017. This is interesting blog content. I remember one thing when I write some Halloween story, and it was one cool thing to write about it because I was able to figure out how the Halloween is can be seen in real life. The good thing is that I am with essay writing websites reviews while doing all of that stuff and it was so great to make that kind of content.